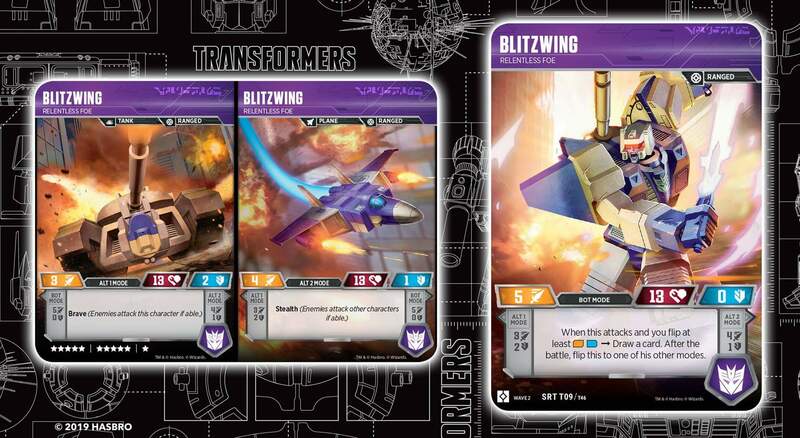 A post on the Official Transformers Facebook is featuring brand new G1 Triple-Changers Bitzwing and Springer cards from the Rise Of The Combiners booster pack for the Transformers Trading Card Game. These are special 3-sided cards (robot mode and the two vehicle modes) that you can fold according to your game strategy. To make things even more challenging for players, both are Super Rare cards like the King Starscream card we recently reported. The booster pack will hit shelves on March 1st. Ooooh, I think you're missing the point on Springer. He's uber flexible. Lets you take advantage of Bold, Pierce, and Tough shenanigans with any of the Upgrades without having to dip specifically into Upgrades with those specific traits. And if you do … BONUS! He's good, not supercalifragilisticexpalidocious good, but good enough. That being said, I do like Blitzwing more. Akin to Springer, you got to Upgrade him up some, but he definitely can become a thorn on the opponent's side with those built in Brave and Stealth modes. sure he's got a helpful ability BUT only if you power him up and attach an upgrade. And your still paying for stars on a mode you mind not be using. And he's SUPERRare. Blitzwing on the other hand is outstanding. I happen to have an extra Darkmount and 2 extra Shockwaves. Check out the trade thread if you're interested! Grimlock, shockwave, darkmount …. I'm more annoyed that there's nothing in place to make duplicates worth anything. Worth anything like say …. trade bait? I mean those dups you have, someone else out there may not. Barter for what you're missing? Out of curiosity, what characters are you looking for/wanting? There's probably others I don't have. I don't mind not having all the characters. I'm more annoyed that there's nothing in place to make duplicates worth anything. Wait, I'm not the only one that doesn't sleeve their cards? I was wondering why I got that notification! Who in their right mind would fold these cards? Look a Pokémon, now they have 20+ super rare cards per set. In boosters where only 1 rare can appear and there are totals of over 60 rates in a set (including the aforementioned super rates) and not counting the reverse holo variants of each! That's more awful, but doesn't detract from this awful. I'm not sure how you intended but I'm not trying to start anything. I love collecting the game and have bought more than enough of wave 1 and have 3 boxes on preorder for wave 2. I am also not opposed to making cards for personal use if its for fun play but that's it, not competitive. I'm just more upset about having to many rares from a collecting standpoint. I don't mind a few but with the ratio, of 1/72 for the 4 in wave 2, you would need to open 288 packs, or almost 10 boxes. Not trying to start anything either– just further clarifying my position/practices, that's all. I didn't want to get into this game precisely because of these SRT shenanigans. With the first set being only 2, and 1 of them a character I can get elsewhere I didn't mind so much. 4 SRTs with 3 of them being major characters without alternates (so far) is awful. I'm right there with you, we collect/play/buy the same way. Alright, look, here's what you do. And I would only say it's ethical to do this AFTER you have bought a substantial number of booster packs from the wave so you are supporting the card game, I do NOT advocate doing this for everything. What I've done is I bought about 40 packs from the first wave (10 boosters, then when I found out I liked the game I bought an additional box, along with the starter set & Metroplex set). Despite getting every battle card except 1 many times over, there were still several TFs that I didn't have, and it bothered me too. I love this game, but they really should include 2 or 3 TF cards per pack, there aren't enough battle cards to justify the 1-6 (or is it 1-7?) ratio of TF cards to battle cards. So, those card protector cardboard inserts that come in the booster packs? Save 'em. 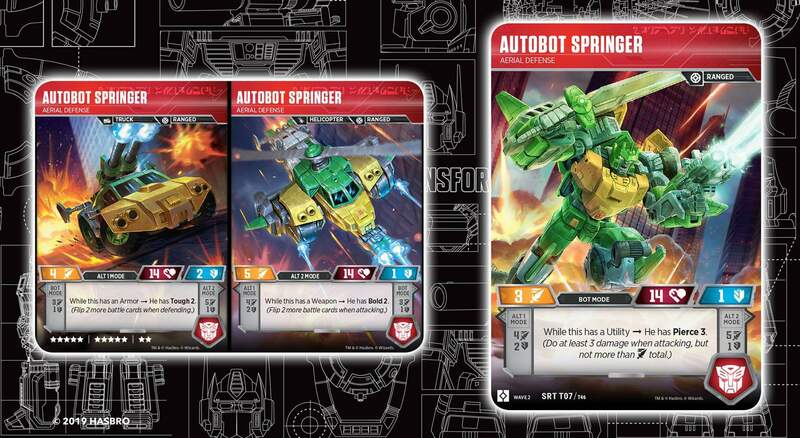 All of the major TF cards have high-quality images online, download and crop 'em, save both sides as an image side-by-side (obviously changes will have to be made for the upcoming combiner and triple-changer cards). Print them out using a high-quality color printer at LETTER size. Then cut the images out of the paper and paste one on each side of a cardboard insert, as this is the EXACT size of a Transformer card. Voila, any stupid Super Rares can be yours. Yeah if there's official tournaments you're not going to be able to use 'em, but among friends I doubt anyone will care. It's how I "have" a Nemesis Prime card from Wave 1 and I didn't spend $80 to get one off ebay or open a thousand booster packs. Also made a Shockwave and a Skrapnel card this way, took like 10 minutes of my time. It's just proxying, I don't think that's a big deal. You draw the line when it comes to if you're supporting the game or not. If you buy only 4 booster packs and are like, "darn, I didn't get the ones I wanted, I'll make the rest", then no, that's wrong. But for Rise of the Combiners, I am buying a full box– 30 boosters. This should be more than enough— I am plunking down a full Benjamin for the boosters, and I'm going to get the Devastator set as well (which is how all combiners should be packaged, IMO). I will have enough battle cards to build multiple decks, and unlike most card games where the whole point is that you can't tell one card from another, you lay out your TF cards at the very beginning. You don't need to "hide" them, so there are no disadvantages to making a couple of TF cards of your own if you want them and they're rare or whatnot. Obviously, your money/hobby, you do what you want. I'm just laying out an easy fix for your problem– if you follow my instructions, it's not like I'm just hand-writing Nemesis Prime's stats down on a piece of paper. Once you make them they are the EXACT size, and nearly the same thickness, of the TF cards– the only differences are the corners aren't rounded and one side isn't foil. It fits perfectly in a deck with "real" cards, you can carry them around with you easily, and the like. But, I mean, especially with the Rise of the Combiners, this whole annoying bit with not getting the ones you want in the first set is going to be OBNOXIOUSLY multiplied. You could spend plenty of money and end up with 4/5 Predacons, 3/5 Aerialbots, 4/6 Optimus Maximus components, etc, and combiner components are not anywhere NEAR as good if you don't have all of them to combine. And screw it, if that's the case and I want an Optimus Maximus deck, I've spent enough where I feel justified making the remaining two. It also helps with budgeting– "I'm spending $120 on Wave 2, there, I've set that aside", and don't have to worry about "just one more booster to get that one I want" or spending ridiculous amounts on eBay.